Here are some Special Constabulary items from my collection. I'm not sure how long this will take to post so I'll just keep adding to this thread as I go. Please feel free to add your material as well and your comments are, as always, welcomed. The Special Constabulary was founded because so many police officers were signing up for military service in WWI that the authorities needed to fill the ranks. 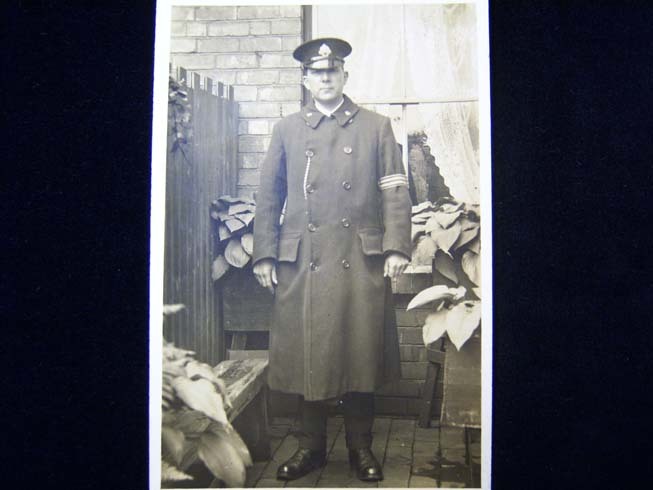 First up is a photo of a Special Constable in "uniform". Please note the armband as I will post a similar item later in this thread. I hope you like this thread and please do add to it. 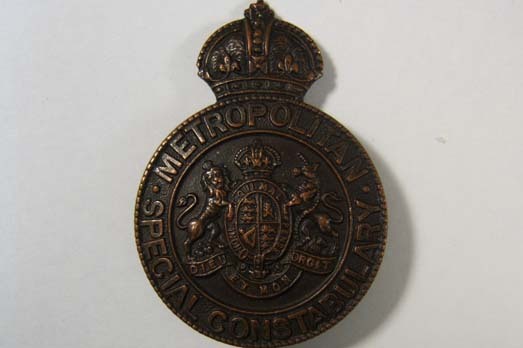 This is a Long Service Medal issued by Metropolitan Police to their Special Constables. I believe this was for 10 years service. The medal shown is a recent addition to my collection the box shown was purchased sometime ago along with an incomplete medal. 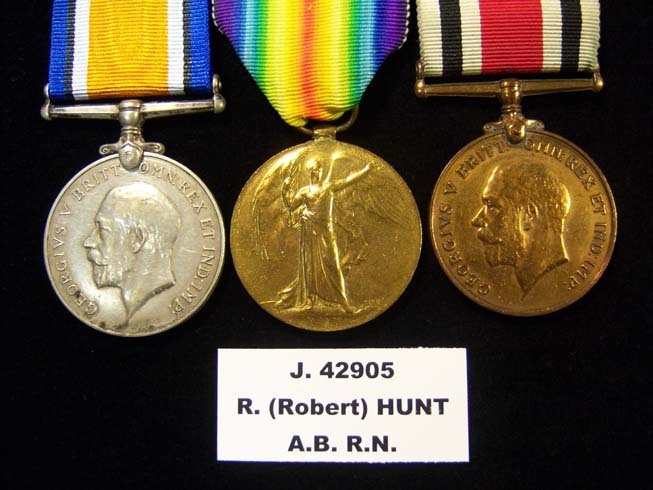 The medal itself is 32mm in diameter and is unnamed. The maker's name is on the back of the suspension bar and reads, J.R.GAUNT, LONDON. There is no ribbon for these medals and they were meant to be attached by way of a pin on the back of the suspension bar. 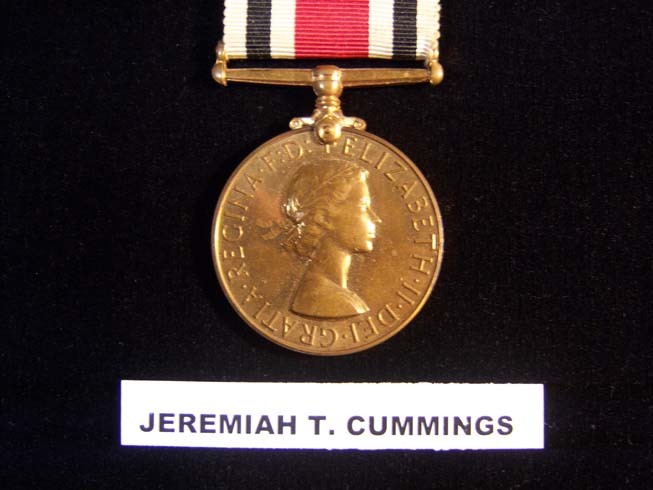 The box, in this case, was from the jeweller who supplied the medal. The lid of the box reads, John Taylor, Silversmiths Ltd., 5 Bream's Buildings, London E. C. 4. 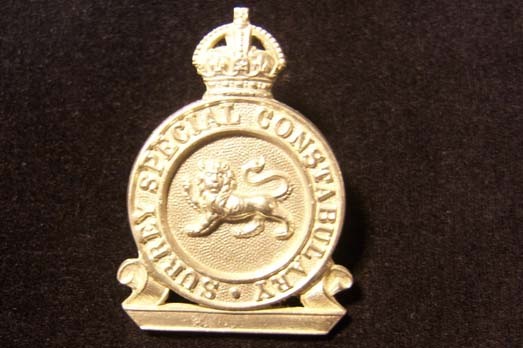 This is the standard Long Service and Good Conduct Medal issued to all Special Constables and was instituted on 30 August, 1919. I will not show the reverse with all of the medals in this series as they have remained the same right up to the present time. Awarded to all ranks in the Special Constabulary for 9 years unpaid service with more than 50 duties per annum. War service with at lease 50 duties counted triple. A clasp inscribed THE GREAT WAR 1914-18 was awarded to those who qualified for the medal during that conflict [i'll post some of these later in this thread]. 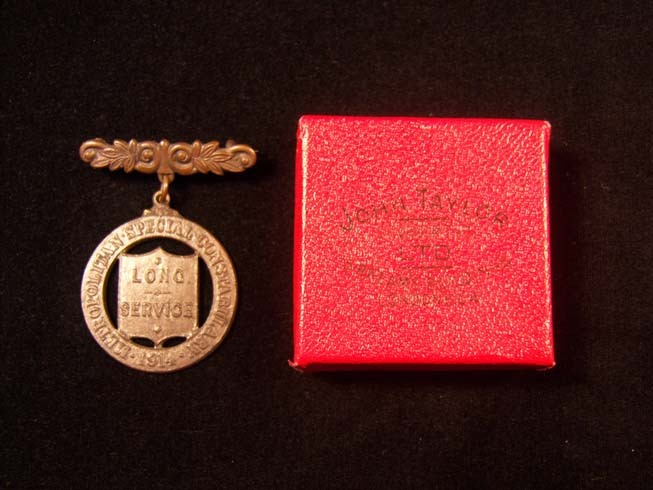 Clasps inscribed LONG SERVICE, with the date, are awarded for additional ten-year periods. I have included name tags will all of the medals I will post so that there is no need to state them in my comments. The obverse of the first issue medal is of George V, Crowned bust in Coronation robes. Here are examples of the bars mentioned earlier. 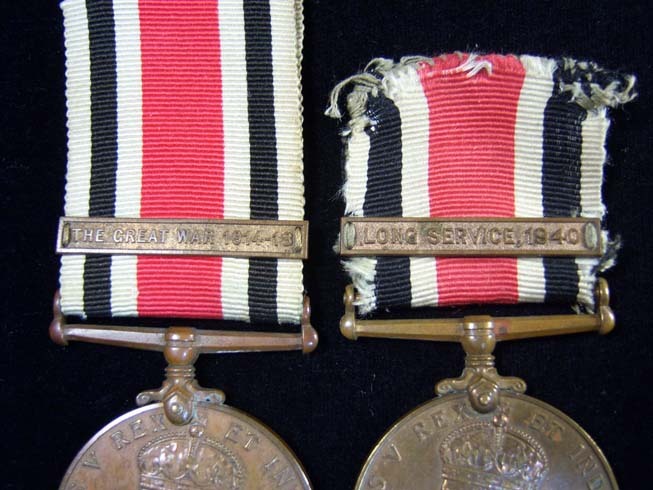 The Great War 1914-18 for service in the Specials during the war and a Long Service bar dated 1940 to signify an additional 10 year period of service. Terrific, Brian. Will look forward to more posts. One question - the photo - was that in UK or, Canada ? These posts are UK only. Being a bit of a gardener I liked the hostas that are growing in the boxes behind the officer. In this group is an example of the second pattern with George V using the coinage profile by Bertram Mackennel. Considering the recipient was awarded the BWM and Victory Medal the Special Constabulary Long Service Medal must have been for service after WWI. The only obverse used for George VI on the Specials LSGC Medal was the Coinage profile. I am not sure if there exists an issue without the IND:IMP as this was used on other medals from 1937 - 48. After 1949 and until 1952 this was replaced with FID:DEF. I have not seen any without the IND:IMP but that is not to say there were none struck. Perhaps some of the members can shed so light on this question. Hi Brian, the fid def obverse was issued from 1949 to 1952 and is quite rare. The last in my series of "type" medals of the Special Constabulary is the Queen Elizabeth II pattern. This has the coinage bust as used on other medals after 1954. The coinage head used from 1953-54 was, to my knowledge, not used on the Specials. There was one quite rare pattern with the Queen wearing the Tudor crown but I have not been able to get one of these for my collection (yet?). As well there is a pattern issued to the Ulster Special Constabulary introduced in 1956 for 15 years of service. The reverse of this medal reflects that it was issued to the Ulster Special Constabulary. Another medal to elude my collection, and quite expensive if I may say so. 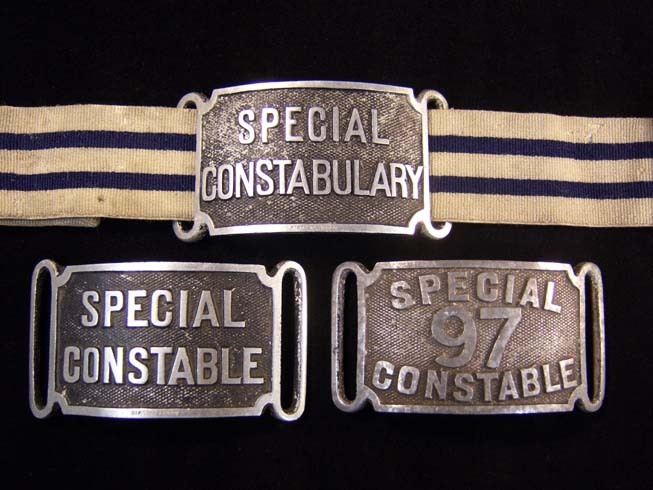 Thanks for looking at my Specials Medals, I'll post more Special Constabulary items later. Thanks for the information and welcome to the GMIC. For some reason I didn't see your post until today (17 May) or I would have responded sooner. Here are three brassards form my collection. These were issued to the Special Constables and are made of aluminum. I understand these are quite generic and were used by many different municipalities. There is a round version that I believe has the city crest (I forget the city's name at the moment) and it seems that every time I see one for sale I am low on collecting funds. Such is the plight of a collector. This is one of my favourite Special Constabulary hat badges in my collection. It is to the Metropolitian Specials. The badge has the King's Crown and measures 50 mm tall and 35 mm in width. The badge is held on by a round lug on the back that would be inserted through a button hole-like opening. The marker's name is on this lug and reads W.O.LEWIS, HOWARD ST., BIRMM. Whether this is WWI or WWII I am not sure and perhaps some of the members may be able to lend a hand with this information. Thanks Mervyn, I'll have to keep watching for the higher rank's hat badges. I have a few more hat badges and some shoulder patches and slip ons that I will post later. This is a Special Constabulary hat badge from Surrey. It has the King's Crown and measures 48 mm in height and 32 mm in width. It was held on by a pin that ran through two loops soldered to the back of the badge. There are no marker's marks on this specimen. 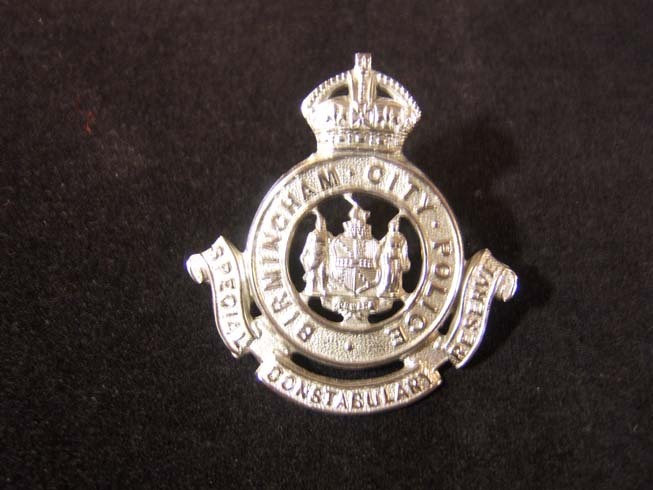 This is a Birmingham City Police Special Constabulary Reserve hat badge with the King's Crown. It measures 51 mm in height and 47 mm in width. It was held on to the hat by a pin that ran through two metal loops soldered on the back of the pin. There is no maker's mark on this specimen. 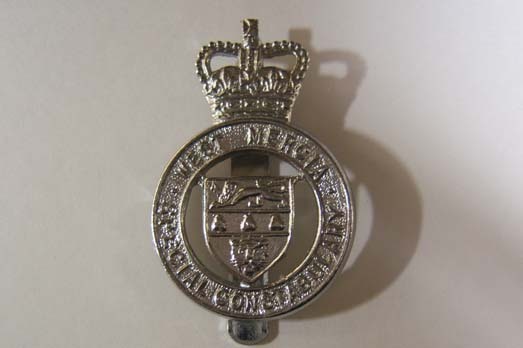 This hat badge to the West Mercia Special Constabulary has the Queen's Crown and measures 50 mm in height and 33.5 mm in width. The bagde was held on to the hat by means of a slider. This slider is marked FIRMAN LONDON. Re the medal marked 1914 I was under the impression this was specifically issued for War service 1914-18. I have always believed that the Special Constabulary was founded due to the lack of police officers because of war service. This being the case I have no idea why the Metropolitian Service medal only has the date 1914. Perhaps one of the other members can shed some light on this. 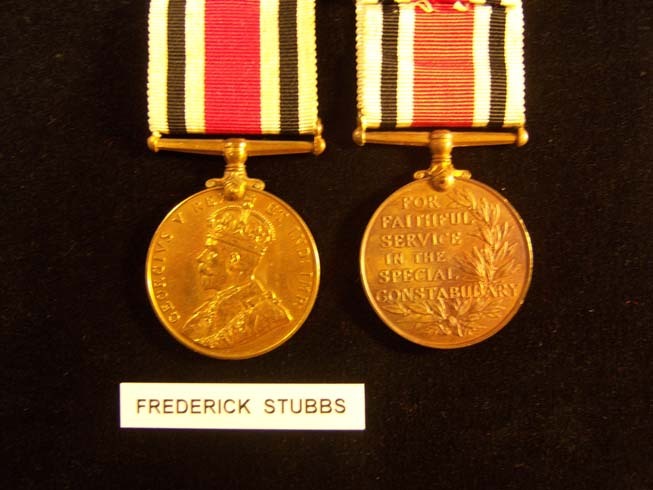 The bar for the national medal states 1914 - 1918, the medal itself being instituted 30 August 1919. 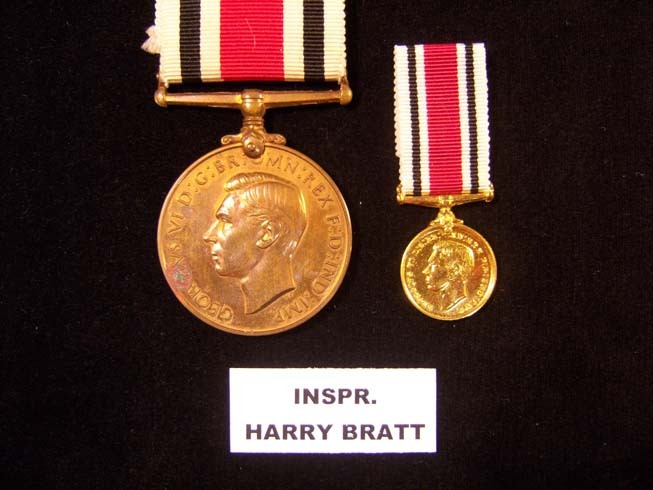 Yet another medal mystery to be unravelled. Brian - this has been a very interesting post - you mentioned Met. S.C.'s - I am attaching the full set - Blue was the senior one. Sorry about the shop tag, I can't take it all out. Very nice bagdes Mervyn. I never knew these existed. Thanks for sharing them, you've made my morning. Alan - good call. I thought I may have got them the wrong way round. As for the white one - I have never seen one, they must be rare - obviously, for that rank very limited numbers. Now, how do I paint a plain one ?? ?